hi! Good work! how are you going to use it? are you going to make lots of loggers and collect lots of data from lots of objects? (diy ecology monitoring…)?? Thanks, I thought I would just put it in a little box and keep it outside for a few weeks and see how the temperature changed over that time, it’s convenient because you can just set it up then forget about it until you need to check the temps. There’s so many things you could do with it, like test your fridge/freezer, check a room’s temperature over a few weeks, put it in a car to see how hot it gets when outside in the sun, maybe even make a waterproof case then put it underwater in a lake, that would be fun! 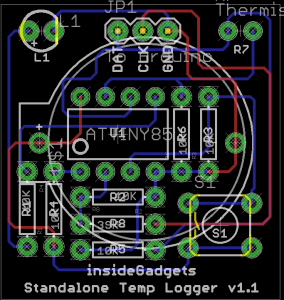 I was thinking about buying some PCBs and possibly turning this into a kit of some sort if there is interest. Only downside is that people will need an Arduino to program it or to extract the data (unless I make a small reader for it to connect via USB but that would probably take me a long time). whoa! USB interface! how long will it take to add such a functionality? Hard to say, I’m working on the write up of another simple project which I should have up in a few days then after that I’ll probably look into the AVR-USB thing. 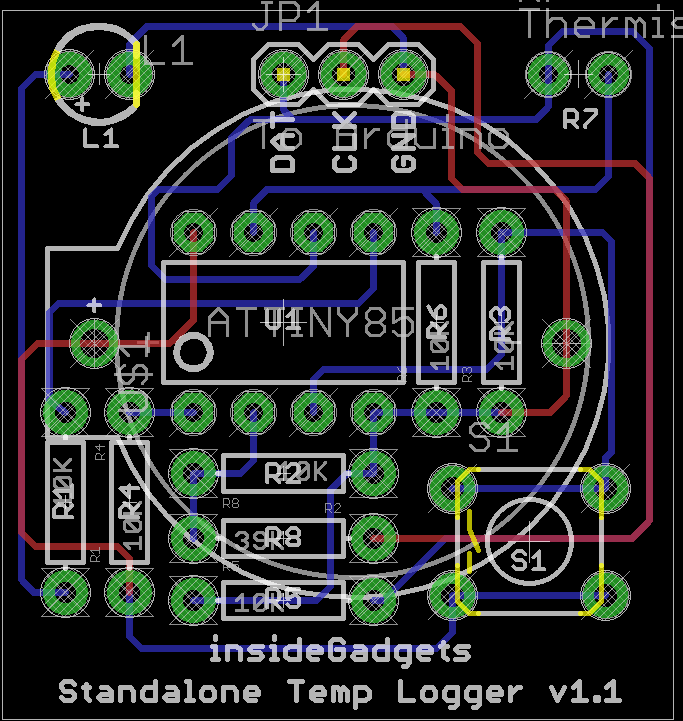 I feel I should just mention that this temperature logger is very basic and designed to be small and cheap, thus it doesn’t log the time or have a crystal so the time delay specified can vary up to 10%. As for your device – of course it would be much better if it could keep the full log (with date and time), but this version is also OK. And I really appreciate your scientific and weighted approach when designing the firmware. Good idea about “small reader” – but it will be better – portable, with LCD and some connector…. to read logger at just “plug&read&save” to SD card! for field adventures, nature monitoring … i’ll think more about it!!! i have attiny45, will it be enought memory? That sounds good. The SRAM size is like under 50 bytes so barely nothing. At the moment the flash size I use for my program is 4220 bytes, you will need to get under 4K bytes for the ATtiny45 which you could do if you removed some code that isn’t needed from my program, for example, remove the part about configuring the delay time or communication with Arduino, it’s up to you. If you are connecting up to an LCD, etc you need to take care with the voltage difference between than and the ATtiny45 (if you run the ATtiny45 like I did with a 3V battery). Edit: Also the EEPROM on the ATtiny45 (256 bytes) is half the size of the ATtiny85 (512 bytes). 4220 is the size of a .hex file? cause it’s twice as more than the actual size of machine code. The properties of the .hex file from windows reads as 11.6 KB (11,885 bytes) however if you use avr-size to the .hex file it reads as below. It confirms the 4220 bytes given by the Arduino software [Binary sketch size: 4220 bytes (of a 8192 byte maximum)]. By looking at that I figured out that the first lot of numbers is rising “:10001000” so this must be the address of where the rest of the data in that line is to go to. If we do 4220 bytes in hex it’s 107C, the 2nd last line says “0C107000” so I’m thinking that’s how avr-size gets the “real” size for the program that will go on the chip from. insideGadgets © 2019 All Rights Reserved. 42 queries in 0.076 seconds.